Now that we are five days removed from the Ghana loss and have had two consecutive days without World Cup soccer for the first time in weeks, I have been able to analyze the scope of the game loss, with better perspective and much much less emotion. The whole situation was a bit of a catch-22. The come-from-behind resilient spirit galvanized and expanded the fan base, to the point that all demographics became emotionally invested in the team, creating a groundswell for soccer the likes of which this country has never seen. At the same time, the come-from-behind position that the U.S. put themselves in each game zapped them of all energy, physically and emotionally. I first pointed it out in my interview with Pat Ianni prior to the Ghana game, but it was clearly evident in the way that the U.S. had no legs in both the first half and overtime period. If the Americans didn’t put themselves behind the eight ball and come back in dramatic fashion, it is hard to know if they would have ever captured the hearts of the millions of Americans in the way that they did. But in the process, they zapped themselves of the necessary energy and could not summon the fortitude for one last run. We all saw the outpouring of energy and emotion in the second half of the Algeria game. With only two days off (a short time in soccer following a game of that magnitude), the boys just took too long to get their legs underneath them. When all is said and done, the quarterfinals is not a dissappointing finish for the United States, as they are probably somewhere between the 12th and 15th best team in the world. But it was the manner in which they lost that may haunt some of the players in the upcoming months and years. A loss to Germany, Brazil or Spain would have been so much more respectable than falling to Ghana, in a second straight World Cup, and with a chance to play the beatable Uruguay in the quarters on the line, to make matters worse. One can only hope that the energy and attention generated here will continue to build momentum for soccer development in the coming years in this country. But for this team and these players, it may be remembered more for what could have been. -Out of the eight teams that won their group, seven won their round of 16 game to advance to the quarterfinals. The only one who did not: our very own USA. -The U.S. won their group while leading one of their contests for a total of only three minutes. That is a record that will never be broken. -Lionel Messi and Wayne Rooney have combined for a grand total of zero goals through total of eight games. Unfathomable. -South America has four out of the eight teams remaining in the quarterfinal draw. The only one of their teams not left in the tournament, Chile, lost to tournament favorite and fellow South American team, Brazil. Europe has only three teams in the quarters. Is the balance of world soccer powers shifting? 1.) Brazil – They have looked particularly solid in all phases of the game after their opening victory against North Korea. They even looked like the old Brazil in their last contest against Chile. 2.) 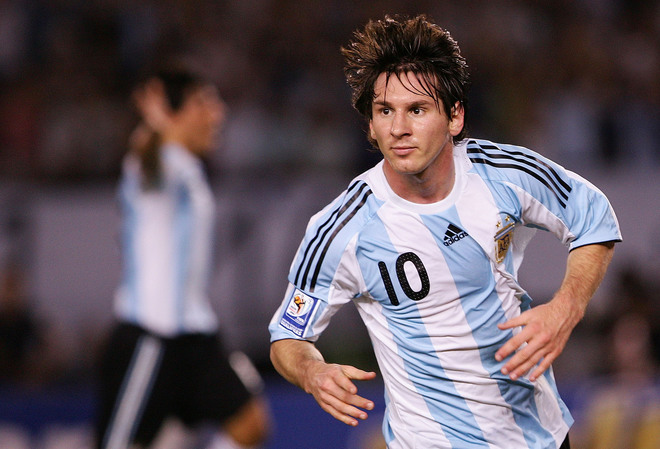 Argentina – They are playing this well and Messi hasn’t even started scoring yet. The quarterfinal contest against Germany should be epic. 3.) Germany – A great blend of youth with experience. They have played some magnificent soccer of late. The Ballack injury may have turned out to be a blessing in disguise. 4.) Spain – After the opening game debacle, they have returned to their old form. They may not be finishing at the rate they had hoped for, but their ball possession is second to none. They match-up well with Paraguay and have the easiest quarterfinal game of the top five teams. 5.) Netherlands – They seem to be lacking that extra flair in the final third. Maybe another game with Robben in the mix will have everyone linking up better. The good news is that their back line has answered a lot of questions, but Brazil will be a whole new animal for them. 6.) Uruguay – Their forward tandem is finishing their chances better than any striking pair in the tournament. They may be a dark-horse if they can catch a few breaks along the way. 7.) Ghana – Their athleticism and speed reared their ugly heads in the extra time against the USA, in the quick counter attack. The extra days off should do them some good after an additional 30 minutes of play last Saturday. 8.) Paraguay – They advanced out of the weakest group in the tournament and did so in underwhelming fashion. They only got by Japan after a shootout victory. They need a miracle against Spain to get through to their first semi-finals. Well I guess for the contest I must start posting. And what better article to start with than Mr Ritzau’s. It is interesting that you had such intriguing comments about the US game when you were not even watching it! Choosing instead to go to a swim meet and miss quite possibly the biggest game in American soccer history. Though I guess in this time and age DVR is always to the rescue, but still I wonder how our Two Touch author could miss such a game.